Fifty-one years ago, September 8 was officially designated as International Literacy Day by UNESCO. UNESCO is the United Nations group dedicated to increasing literacy rates around the world and using literacy to empower people and communities through inclusive, equitable, and quality education. 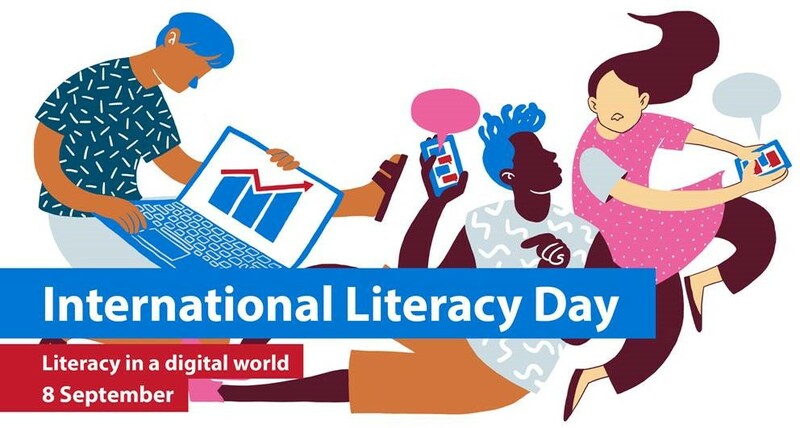 Each year UNESCO celebrates with a different theme; this year’s is “Literacy in a digital world”. As the role of technology is such an important topic in education today, we at Custom Education Solutions were excited to see such a forward-thinking theme. Since so many of today’s students are growing up surrounded by smart phone, tablet, and computer screens, some have taken to referring to them as “digital natives”. Our students are constantly connected through social media and have access to more information than they can imagine simply by Googling it or asking Siri. The world they are living in is very different from the one many of us grew up in, and it is having a significant impact on how students take in information and communicate. However, just because students can Tweet, DM, Facebook, and post on Instagram doesn’t mean that they are digitally literate. Digital literacy demands skills beyond what is traditionally taught in the classroom. Education must adapt to how technology is changing the world and help students become better prepared to live and work in that world. So what does it mean to be literate in a digital world? Digital literacy goes beyond simply being able to read and write. Students must also be able to use technology to find information, think critically to evaluate that information, communicate and collaborate with others, and create multi-media works to share information. These 21st century skills are essential for our students’ success, yet many teachers are unsure of the best way to incorporate digital literacy into the classroom. Not only does reading on a screen requires different cognitive skills than reading print, technology offers nearly limitless potential for collaboration, creating, and publishing. Both can be challenging. I was initially a bit hesitant to incorporate technology in my classroom, as I was worried about not being able to control every step. I quickly learned that like all other classroom management issues, clear, specific guidelines and expectations go a long way. Luckily, there are also a number of awesome new resources that help guide students’ development in digital literacy. Here are some of my favorites, and how they help develop literacy in the digital age. In an increasingly paperless society, much of what students read is on a screen. Studies have shown that students’ comprehension and retention of information suffers when reading digital text, so it is crucial that we give students to tools and skills necessary to prevent as much of that as possible. Many publishers offer e-book subscriptions, which is awesome. However, it isn’t enough for students to just be able to practice reading digitally. Reading on a screen may improve visual literacy, but it also discourages careful reading. Students must be able to interact with the text in a way that allows them to process what they’ve read, internalize the knowledge, and reflect. Close reading is important for print, but it is imperative for digital. One publisher that has taken this to heart is Benchmark Education. Their digital e-book library, Benchmark Universe, is great because each of the over 3,500 books is completely customizable. Students can type notes in the margins, highlight, add sticky notes, have the text read to them, circle and underline text, and annotate the books. These features gives students and opportunity to analyze what they are reading and think critically, which will improve comprehension. With easy search features, drag and drop assignment of books, built-in teacher’s guides and text dependent questions, and the ability to embed multi-media, Benchmark Universe provides significant advantages over traditional e-books. One of my favorite features is that students can write book reviews for their peers to read. This adds another layer of collaboration, and teachers have the ability to approve reviews before they are published. For schools looking for a blended approach, all of the books on Benchmark Universe are also published in print. There are so many amazing ways for students to collaborate and publish works digitally now. Students are no longer limited to collaborating with classmates; now they can work with people all over the world. As a former 8th grade language arts teacher, I found the possibilities both exciting and a bit daunting. Collaboration can open the doors to inappropriate use of technology, as it can be difficult to monitor. My school was a Google school, so I would use Google Docs as part of the writing process. Since it’s free with a Google account, it’s really convenient. I could see the revision history of the students’ work, leave suggestions, and write comments to better facilitate and coach students. Students were quickly able to share their work with classmates to get feedback or work together on a project. We even would do projects with a class from another school. While there were a lot of great features, it was still a bit too open for my liking. An awesome new program that leads students through the entire writing process digitally is Writer’s Universe from Benchmark. It features short video introduction and features about each genre, a mentor text for students to analyze and interact with, brainstorming designed to help students generate ideas and choose the best one, outlining, drafting, revising and editing, publishing, and the final step is a self-reflection. In addition to the support for all stages of writing, another major advantage of the program is that it gives the teacher more control. Before students can unlock and advance to the next stage in the writing process, the teacher must give their approval. This helps catch major errors before the students plow ahead. It also allows the teacher to conference with the student via a chat screen, and teachers can pair students for peer conferences and monitor their discussions. For many teachers like me, this extra layer of control makes me more excited about moving the writing process online. At Custom Education Solutions, we are happy to help you tackle the challenge of improving students’ literacy in a digital world. Technology is rapidly changing the way we communicate and process information. Teaching students how to read digital texts closely and write and collaborate effectively is what will help them truly earn the title of “digital native”.